22,500 police officers yesterday marched through central London as part of their demonstration against the pay policy of the Labour government. The march was stewarded by some 400 members of the National Union of Mineworkers. "Clearly a demonstration of this magnitude needed to be carefully policed, but not by the police who were the ones protesting. 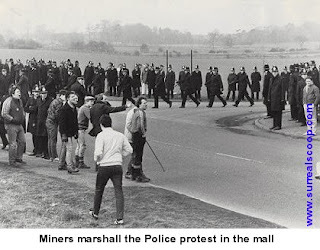 Fortunately we were able to call upon people with experience of past demonstrations involving the police, former miners, " said Home Secretary Jacqui Smith. "Many of them have extensive experience of demonstrations with the police going back as far as 1984." One such steward, Arthur 50 from Orgreave in Yorkshire, said that he was happy to get some extra money and in many ways supported his former foes in their quest for a backdated pay increase. "It’s a nice change to be here, getting some money out of a demonstration, rather than a truncheon around my head and a kick up the arse from one of the police horses," he said. "It’s also nice to see a few of the old faces from the past. I spotted one bobby who I hit with a brick near on 25 year ago!" Superintendent Geoffrey Billingsworth, a veteran police officer with over 30 years experience with the force said that he was marching today to ensure that the young constables just starting out on their careers get all the chances he had. "The young copper today, he doesn’t get the vast wedges of overtime that I enjoyed when I was a wooden top," said Billingsworth. "There aren’t the mass running battles across Yorkshire hillsides like we had in the 80s, or even fervent mobs of young student Trotskyites in Trafalgar Square in the 90s. Without the fun of clubbing a few hippies you only have a good basic pay to keep you a straight member of Her Majesty’s Filth."